Posted on Thu, Sep 9, 2010 : 5:11 a.m. The interior of Cake Nouveau's new, expanded location. If I could pick a favorite dish, it would be a simple one: cake. And I don’t mean the elaborate tortes with several layers separated by different flavors of mousse, often topped with chocolate shavings and fancy wafers. No, I’m talking about your basic, vintage 1960s concoction, a staple at any child’s birthday party: yellow cake with thick, creamy white frosting (decorator icing optional). A slice of that cake can make my day. So it was without complaint that I ventured to Cake Nouveau to check out its new location. This dessert shop was launched in the Kerrytown area in November 2006, with a bright storefront as dramatic and sugary as its interior space. A display cake at Cake Nouveau. But owner Courtney Clark, who also prepares custom cakes and has won several national cake competitions, quickly outgrew the space. In May, she relocated to Packard, a far more spacious destination that allows her ample room for her baking and classes, as well as a roomy storefront. The bakery has an enchanting colored pink awning that beckons you to enter, a contrast to the muted businesses that surround it. Half of the store is a cake-decorating station, the other half a retail area. When we were there, several young girls were immersed in one of Cake Nouveau’s cake decorating classes. Like its predecessor, the design is part Willy Wonka’s chocolate factory, part Mad Hatter tea party, with green and purple tile and pink and purple walls accented by swirling white stripes. There isn’t much seating capacity except for a big overstuffed couch and a small glass bistro table with a few chairs. Cake Nouveau’s specialty is cupcakes, and four are offered daily. Chocolate truffle and vanilla beany are the staples. These two were my favorites, the closest to old-fashioned cupcakes of my youth. Both had moist interiors. 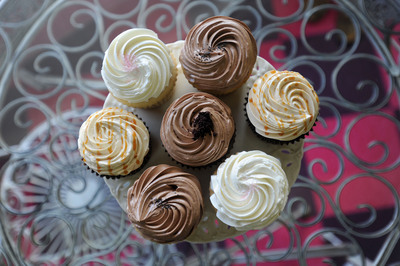 Clockwise from top right: tangerine poppyseed, chocolate salted caramel, vanilla beany, and chocolate truffle (center) cupcakes made by Cake Nouveau. Every week there are two specialty cupcakes. The blueberry morning was one of them. It resembled a very sweet blueberry muffin, though with yellow cake. The most exotic flavor on my visit, chocolate honey lavender, was a miss, with bland frosting. Even if I could taste it, I don’t think lavender is the most appetizing flavor to pair with cake. As for Cake Nouveau’s buttercream frosting, it’s not what you’d expect on a routine cake, having far more gourmet taste and texture. Full disclosure here: I’m a cake traditionalist, and I actually didn’t like this frosting nearly as much as the kind on top of standard, far more ordinary, birthday cakes, which is thick, dense and creamy; I find Cake Nouveau's too buttery. In addition to the cupcake selection, there are now cake truffles, introduced this summer. These are made up of cake trimmings and buttercream and are more like fudgy mini-cakes. There are five different flavors offered daily. Hours: Tuesday through Saturday, 10 a.m.-7 p.m. Plastic: Visa, Mastercard, American Express. Prices: Inexpensive. Each cupcake is $2.50. The best on my recent visit, hands down, was the white chocolate raspberry: chocolate cake and raspberry coated in white chocolate. I liked this because it most closely resembled an actual truffle, with a candy taste and texture. Almond Joy cake, laced with coconut, was another standout. The chocolate birthday cake was simply too dry; I would have preferred a fudgier interior. Lack of advertised flavors detracted from both the blackberry cake and chocolate peanut butter truffles. I enjoyed the cookie nouveau, one of the two cookies available. Full of delicious chunks of dark and white chocolate, toasted coconut and toasted outs, it was big, chewy and delicious. Prices here are also reasonable, only $1 for an ample cookie, and $1.50 for each truffle. Cake Nouveau undoubtedly provides the same inexpensive, tasty pick-me-up as ever — it's just now in a different part of town. Thu, Sep 9, 2010 : 9:49 p.m. I love buttercream! It's fantastic! Thu, Sep 9, 2010 : 4:32 p.m. I always watch Challenge on Food Network, so I've seen Courtney Clark on TV. That's great she has a storefront with classes. I love the playful decor in the store. Hope to stop by soon! Thu, Sep 9, 2010 : 12:36 p.m. I agree with LANDS...just served her minicupcakes at our daughter's wedding shower in July....so glad she moved to our neighborhood...walkable for a special treat! Thu, Sep 9, 2010 : 7:01 a.m.
One thing I think worth mentioning is how practical cupcakes are for special events. No cutting, very high portability, individual servings, &amp; variety. Their new loction next to Morgan &amp; York offers not only more workspace which is important to growing business but also FREE unimcumbered parking for patrons (yeah). The owner Courtney has a genuine and infectious smile, you can tell she enjoys her work. Way to go Courtney Clark, my family will be in soon.